WiFi these days is as universally necessary as the air we breathe! OK, it’s not. It’s merely a modern-day feature with which we have become so accustomed, that once it’s gone, we miss it like we do screenwash from the washer bottle! WiFi is something you’ve accepted as the norm, probably (for the younger ones reading this), for your entire life! When it’s missing, there’s no 3G / 4G data signal on your smartphone and you want to Tweet the world about something, the absence of WiFi is enough to tip you over the edge! The one and only other thing that can be more annoying than not being able to Facebook your latest selfie, is when you’ve been promised WiFi, made a decision to stay somewhere based on the strength of this information, and it’s NOT there! This is like driving home from the take-away, only to realise you’ve paid for fried rice, but not bloody got any! Cheated on a scale similar only to the Blue Peter dog (and cat) naming scandals, realising that you’ve booked a 3 night stay in a hotel without functioning WiFi, is akin to spending 3 nights at Her Majesty’s pleasure! So, you might not get “more than you bargained for in the shower”, but to get less than you bargained for in the bedroom makes my blood boil. 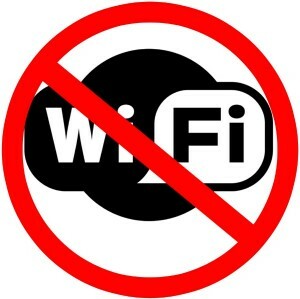 If my employer, my mother, some of my mates, the local, the coffee shop didn’t have WiFi, they’d be lucky to see me. My digital life is not ruled by Facebook or Twitter by the way – rather the need to send and receive email, access the internet occasionally, and “stay online” without seeing that waste of space “GPRS” on my phone, is MY underlying need for a data-squirt. The prospect of staying somewhere without WiFi, is marginally better only to the planning of my own funeral. However, there’s one thing even worse than having NO WiFi, and that’s staying in a place which purports to have WiFi, but doesn’t really!